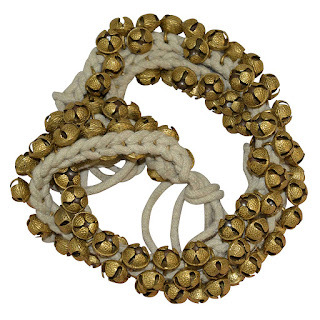 Ghungroo or dancing bells are musical anklets tied to the feet of classical Indian dancers. A string of ghungroos can range from 10 to 200 bells knotted together. Ghungroos are worn in traditional performances of the classical Indian dance forms. These ghungharus are globular bells each about 2 cm in diameter. Dancers string them on ropes or sew them onto cloth or leather strips and wear them around ankles. Larger ghungroos may be strung on a circle of wire and shaken as accompaniment to a song. They are often fixed to other instruments to add to the sound. The bells are decorative in themselves and the cords strung are often bright and finished with tassels. There are two common forms of the ghungroo. In traditional form it is merely a number of bells woven together on a cotton string or cords. And the same are used in dance forms like Kathak. But these types for anklets are not cozy for dancers to wear. In modern for these ghungroos are stitched to a padded cushion made of soft cloth like velvet or soft leather to make them easy to wear. This may then be strapped to the feet of a dancer.